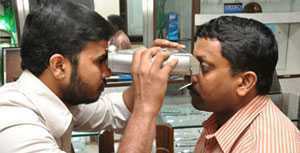 While the Clinic helps you see clearly, the in-house Optical Showroom helps you look perfect. 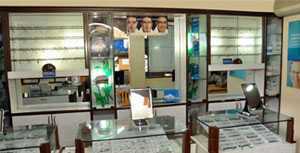 The latest range of lenses, glasses and frames, both national and international, are available here. 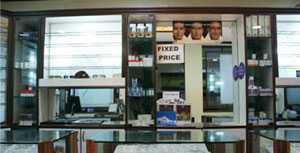 Experienced staff, courteous service and high quality products make shopping for your visual aids a pleasant experience. Glasses or corrective glasses are normally worn for vision correction or eye protection and comprises of frames bearing lenses worn in front of the human eyes. Sunglasses: Sunglasses are a kind of protective eyewear designed to prevent the damaging or discomforting of the eyes by blocking out the bright sunlight and high-energy visible light which are harmful for the eyes. Shell Frames: In the shell frames, the original material used is a tortoise shell or plastic that simulates this material. These frames are durable and usually used to hold higher power and thicker lenses. Carbon Frames: Carbon Fiber Graphite (CFG) or Carbon Frames are usually black in colour providing the endurance of metal frames but are more flexible, thinner and lightweight. In this day and age, these frames are the hot sellers especially since they are available in a variety of colours. Metal Frames: There are many types of metal frames such as aluminium, cobalt, monel, Beryllium, flexon, nickel silver, phosphor bronze, stainless steel, and trilam. Metal frames are usually light and elegant with attractive colours. Resilens: Resilens (CR 39) are most suited for protection of the eyes from ultraviolet rays emitted from TV and computer monitors and sunlight. Photochromatic: Photochromatic lenses are usually capable of changing the shade of the glass when exposed to sunlight making it look like sunglasses. They are capable of becoming white again when in shade or indoors which makes it easy for viewing. This type of lens has caught on and become the new trend in the market. Hi index: Hi index lenses come with the provision of having higher powers in a thinner and more elegant lens unlike the big bulky ones before. Progressive Lenses: Progressive lenses are the special lenses used for presbyopia which has a slow transition from distance to near correction without any visible demarcation line between the two.